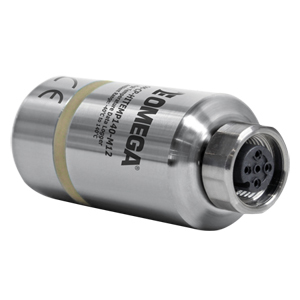 The OM-CP-HITEMP140-M12 is a rugged and versatile high temperature data logger featuring an M12 probe connector. Compatible with a wide variety of M12 RTD probe styles, this data logger is capable of measuring up to 850°C (1562°F) (probe dependent). With the ability to change probes as needed, this device satisfies a multitude of application needs with one powerful data logger versus the need for multiple loggers. The OM-CP-HITEMP140 data logger has a water tight body enclosure made of food grade stainless steel. It can be placed in environments with temperatures as high as 140°C (284°F) making it suitable for a wide range of applications including autoclave verification, food preparation and processing, environmental studies, well monitoring, washer disinfectors and pasteurization. The OM-CP-HITEMP140-M12 records and stores up to 43,690 time stamped readings and is equipped with non-volatile solid state memory which retains data even if the battery becomes discharged. Using the OM-CP-HITEMP140-M12 software, starting, stopping and downloading the OM-CP-HITEMP140-M12 is simple and easy. Graphical, tabular and summary data is provided for analysis and data can be viewed in °C, °F, K or °R. The data can also be automatically exported to Excel® for further calculations. The OM-CP-MULTIMOUNT-Z is a versatile mount or stand for use with the OM-CP-HITEMP140 series of data loggers. It can be used to stabilize a logger inside an autoclave, or screwed to a flat surface to create an anchored base. The OM-CP-MULTIMOUNT-Z is made of stainless steel and is able to withstand temperatures up to 150°C (302°F) making it ideal for use in autoclave sterilization processes. The OM-CP-ALUCASE-14 and OM-CP-ALUCASE-18 are high quality, multi-purpose briefcases, designed for the protection, transport and storage of data loggers, equipment and accessories. These durable aluminum cases include pick and pluck foam inserts, allowing the user to customize a snug fit and secure any combination of products. The briefcase frame is strong yet surprisingly light weight with a comfortable ergonomically upholstered handle. Two sizes are available: a compact 36 cm (14") width (OM-CP-ALUCASE-14) and large 47 cm (18") width (OM-CP-ALUCASE-18), both featuring an egg crate foam lined lid and keyed locks. The OM-CP-IFC406 is a multiplexer data logger interface for compatible OM-CP Series data loggers. The OM-CP-IFC406 allows up to six data loggers to be connected into one interface. Up to three OM-CP-IFC406 units may be daisy-chained together to communicate with a total of 18 data loggers through one USB port. To connect multiple OM-CP-IFC406 multiplexer interfaces together, simply join the units side by side, making sure the spring pin contacts are connected and magnetically joined. 참고: Comes complete with 3.6V lithium battery. Operator’s manual and USB interface cable are included with the OM-CP-IFC400 software/cable package and OM-CP-IFC406 multiplexer. OM-CP-IFC400 required for data logger operation. Both models sold separately).